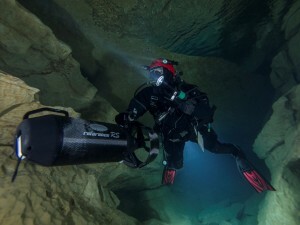 In August 2014 Peter Goosens and Jolanda Spronck – two cave divers from the netherlands – participated in an international expedition into the cave Pozo Azul. 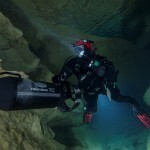 The Pozo Azul is a giant underwater cave in the north of spain, where you have to dive more than 10 km in it, to reach the end like it is known until now. 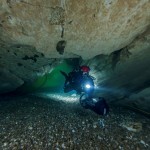 But there is more to discover! 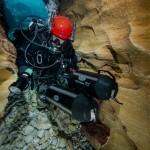 Peter and Jolanda accompanied the exploration team as support divers. 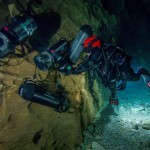 The expedition photographer Peter taking high quality pictures and Jolanda writing the texts for numerous famous magazines in the trade press they are working as a successful team since many years. 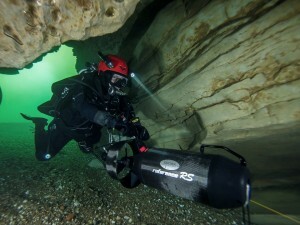 On the expedition in north spain the team was endued with BONEX Reference RS scooter as the main equipment – furthermore they had 2 BONEX Discovery RS scooter as Back-up-device. 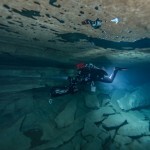 Orininally the Pozo Azul was discovered by spanish cave divers in the sixties. 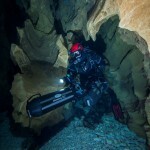 In the year 1991 the end of the explorations was reached with a distance of 1780 meters and 39 meters depth, because the equipment was not that good at that time to penetrate deeper without taking a high safety risk. 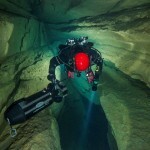 The exploration of the Pozo Azul went on in 2001. 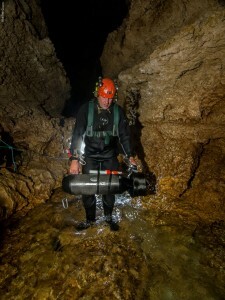 Jason Mallinson, a passionate cave diver, who already discovered and extrapolated several french cave systems in the nineties (like the Emergence du Ressel), travelled to spain to explore the unknown cave system. 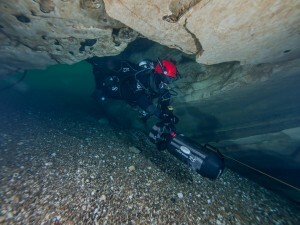 As equipment he already used for the french caves a big, fast Aquazepp underwater scooter and a CCR Rebreather, which gave him the possibility to make longer and deeper dives. 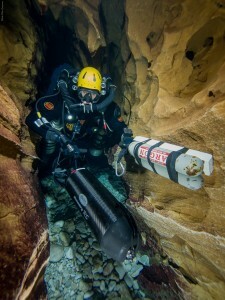 Year after year he travelled back to spain with better equipment and the help of a growing team of Spanish and British support divers, to continue the exploration of the cave. 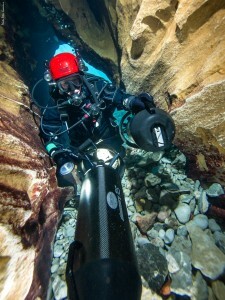 The years before he always worked alone as a cave diver. 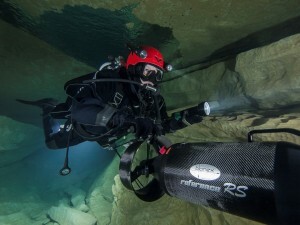 But now the risks raised – he was alone diving for hours in the cave systems, only equipped with 1 scooter, 1 Rebreather and 1 Back Up Zylinder. 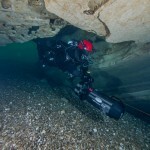 It was time to adapt constellation and equipment to the conditions. 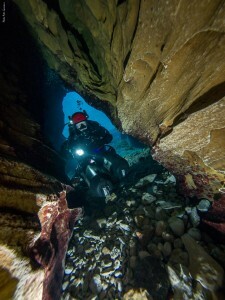 As a first step they put the exploration period exclusively on the end of the summer, because many times the expeditions failed due to bad weather conditions. 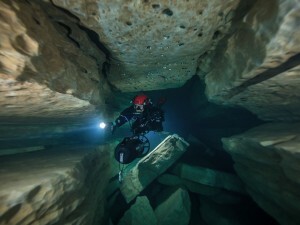 As a second step they put in the caves on the beginning of the second swamp a habitant, where the diver could do his last, long decompression stop on the way back. 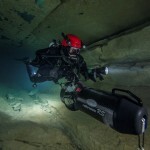 The advantage of this constellation was, that the tired and subcooled diver could rest partly over water when he was finishing his decompression stop. Moreover he had the possibility to take warm drinks and food during his stay. 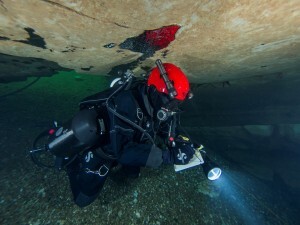 As the last step the team initiated a second scooter: until the last border the diver used a big mounting-scooter, which he deposed on arrival at this border line. From there he used the second, smaller and lighter scooter to go on. 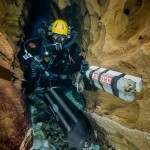 This enabled the best adaption to the conditions. 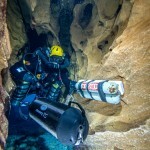 Starting 2009, the existing exploration team was extended by Rick Stanton, John Vonlanthen and the dutchman René Houben. Also the support team was grown in quantity and quality. 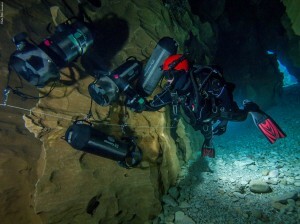 Meanwhile around 25 Spanish, British and Dutch cave divers were involved in the project and took care of organization, equipment transport and logistics. 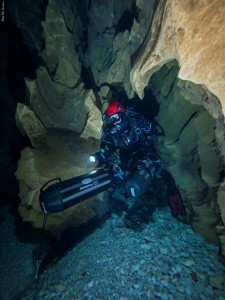 And this was necessary, because often it was very exhausting to bring the equipment to the place of exploration. 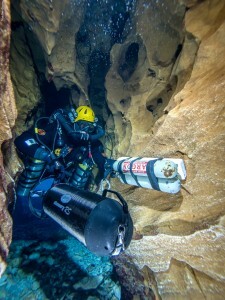 Furthermore it was important to take care of the physical and mental fitness of the cave divers, so that they were able to do the following dives safely. 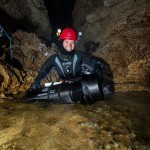 There was at least one person who knew all equipments by heart and could help the cave divers to fix everything on the right place. 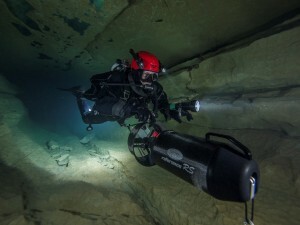 In 2009 Rick Stanton dove with a back- and a side-Rebreather as Back-up, a big mounting-scooter, 2 BONEX Back-up scooter and a 20 liter-Trimix-cylinder into the cave. 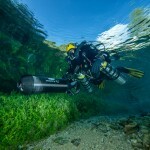 Finally he reached the end of the second swamp on a distance of more than 5.160 meters from Burbuja, and therefore more than 6 km away from the entrance. 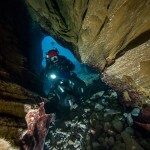 By this time the dives took around 6 hours including the decompression and the laying of new diving cave lines. The new discovered gallery was named Tipperary, derived from the song the team was singing alltime: “It’s a long way to Tipperary, It’s a long way to go”. And that was definitely the truth! 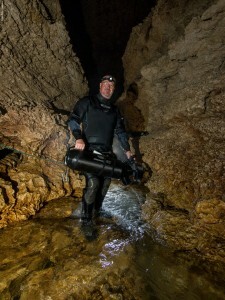 When Rick Stanton took his first breath of fresh air after the transition, he was under earth for around 18,5 hours. 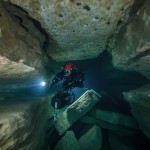 From that time on the team build upon his experience, because they had enough practice now to conduct additional long dives. The way through the swamp was intimate terrain and they did not need guiding lines anymore. 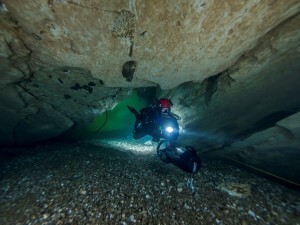 The dry Tipperary cave was used as a bivouac-area to take a rest before the further explorations. 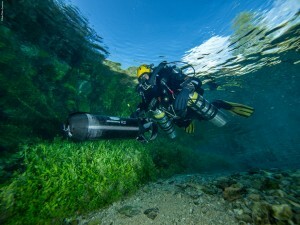 In 2010 they find the almost 3 km long third swamp and reach a new world record with that. 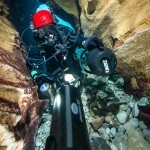 At that time this was the longest cave dive ever made. 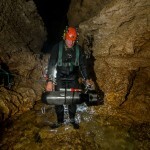 This success continues in 2011, when the team discovers a new dry cave and a fourth swamp directly following. The transition of this dry path (called Razor passage) is quite dangerous, because it is covered by numerous cutting edges. 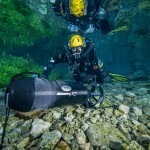 The risk to destroy the dry suits is high. Considering that they were around 10 km from the entrance this would be a catastrophy and had meant the end of the expedition. 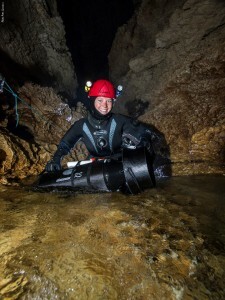 After a small expedition in 2013, the explorer team visits the cave again in summer 2014. 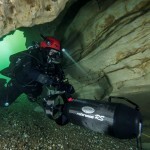 This time the three cave divers Jason Mallinson, René Houben and Rick Stanton will prope into the cave until the end and go on exploring. They discovered a further dry path behind the fourth swamp (Razor ll). 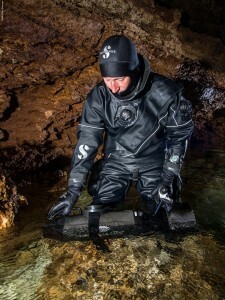 Jason´s scooter is not working and has to be repaired, his dry suit gloves are not waterproof and Rene´s suit heating gives up in the night before the big dive. Rick Stanton has to go back, because the engine of his mounting-scooter breaks-down unexpectedly. Luckily the team can default to his two BONEX Back-Up scooter and Rick can return safely. Despite of all this dysfuntions, Jason and Rene reach Tipperary, where they take a rest. 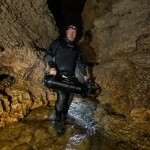 Shortly afterwards they continue to explore the dry galleries. In consideration for all the exertions before they find around 2 km new way. 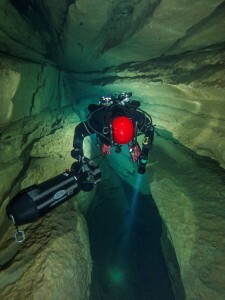 After a good sleep, Jason and Rene continue diving and protude until the end of the third swamp. 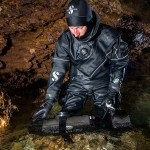 Here they change their dry into wetsuits and go on diving through the fourth swamp until the dry cave Razor ll. 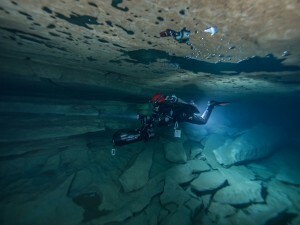 Here, around 10 km away from the entrance, where 9,5 km are made underwater, they discover waterfalls, which they climb up and finally find a fifth swamp. 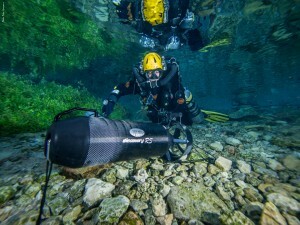 With the two small cylinders, which they brought especially for that, they dive through the fifth swamp and arrive at an active river. 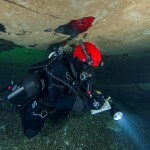 Rene leaves the water and attains a visibility of hundreds of meters. But he returns back to Jason, not to take anymore risks. 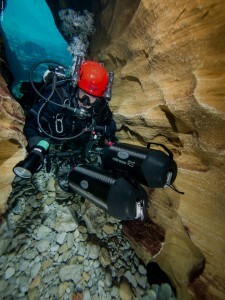 Euphoric because of all the discoveries they made, but also confused how to proceed, the team celebrates the return of the divers after 3 days. The explorers now confer about the benefits of going on exploring: Does it make sense to do a second bivouac-area more inside the cave? 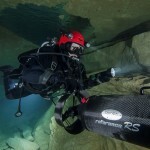 Do they need more support divers? How can they optimize the preparations?